If some of you have visited previous Expos, they certainly visit the travelling exhibition of the Bureau International des Expositions. This exhibition was held in Astana (Kazakhstan) from january 11 to march 10, 2012, for its Expo 2017 bid. 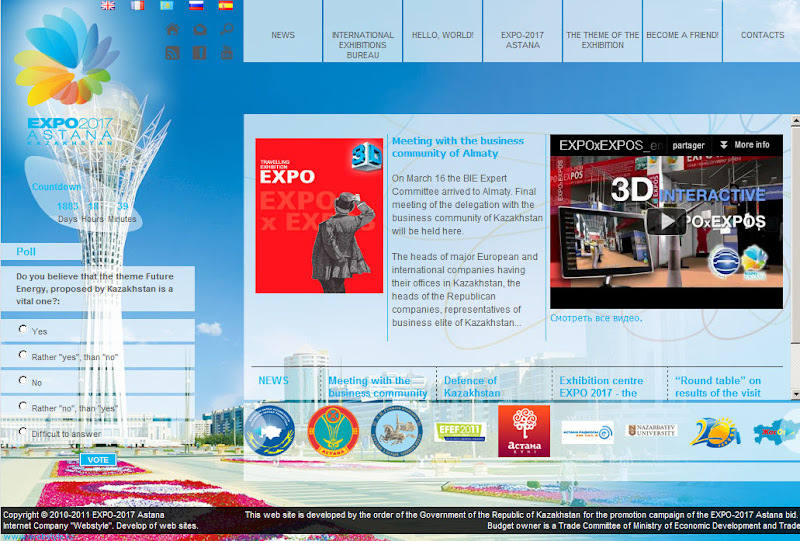 Now the event is finished, but you have the possibility to visit the EXPOxEXPOS of BIE in 3D on the Astana 2017 Website. That was very interesting. Thanks for the link. What was that? I don't get it. And I need an atlas to locate Astana. It seems to be something nice and interesting info. 3D exhibition is the new thing for me. I'm very exciting for getting info about it that which type of techniques that have used in it. Is there any site throught which i can get up to date of this expo..?